Walk to everything. Comfy cabin style motel room with a kicthen. Private entrance to 2. Little vanity area fro getting ready. Bedroom with queen bed. Enjoy a DVD or cable in the living area. Full futon and a comfy chair. Great place to read a book. Fully equipped kitchenette. Dinning area. Bathroom with stand up shower. Lakefront Cabin's quaint one bedrooms sleep four. The room has a queen bed and a vanity area along with a small dresser and closet for your belongings. The bathroom, adjacent to the bedroom, has a standing shower. The living area has a wood framed, full futon. Enjoy watching cable TV or DVD's on wall mounted 32" TV in the living area. These cabin style motel rooms also come with an equipped kitchenette. Prep meals and enjoy at the dining room table set for four or outside at the picinic tables. When the weather is nice, step outside to the lovely court yard. 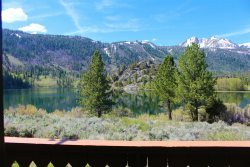 Enjoy barbequing or taking the fresh air and sights June Lake has to offer. It is a great area to relax after a long day of sight seeing, sking, fishing or hiking around. Just steps away from June Lake and the June Lake Marina. This family friendly property is also walking distance to the village shops, resturants, Gull Lake and Gull Lake Park. Lakefront Cabins also has complementary WiFi for each room.